Sometimes I use my job as a Mom as an excuse to test out adult education lessons. Recently I bought some geometric solids made for a Montessori lesson. This lesson is intended to be taught to 3-6 year olds, but adult students can benefit from a refresher on the names of these objects. And I ended up learning something really important about math in the process. My well-planned idea went out the window when the box arrived. Before I could practice my presentation, my kids wanted to help take everything out. 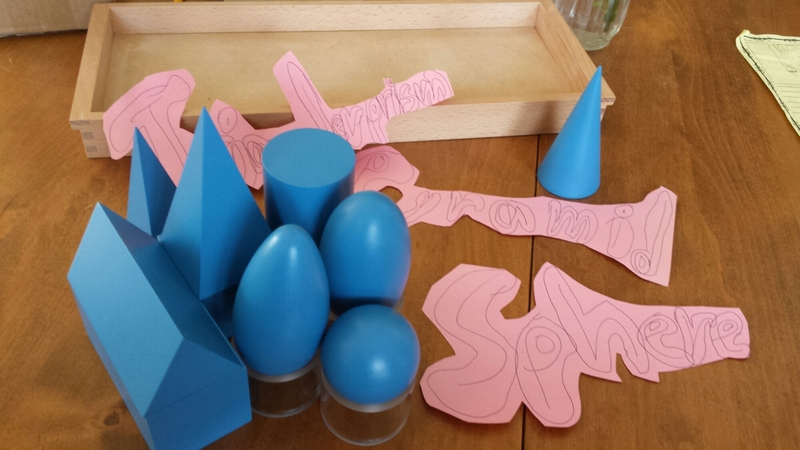 Then they started stacking the blocks and turning them into castles and guns while I struggled to remember the difference between the two egg-shaped pieces. My kids started to debate which one looked like a potato and which one was an egg. While I quickly re-read the Montessori Geometric Solids presentation, they organized the pieces into stacks with the same bases. All the triangles were stacked, the squares were stacked, and the circles were stacked. I started by asking what makes certain blocks easier to stack on each other. The answer is that they have similar shapes on the bottom, called the base. I asked them to trace a base on paper to see that the shapes are the same. Then they wanted to cut them out, just for an excuse to use scissors. Next I asked how many names of the shapes they already knew, and we discussed some new words. This is where things got really interesting, because again the kids started to see patterns before I even mentioned it. 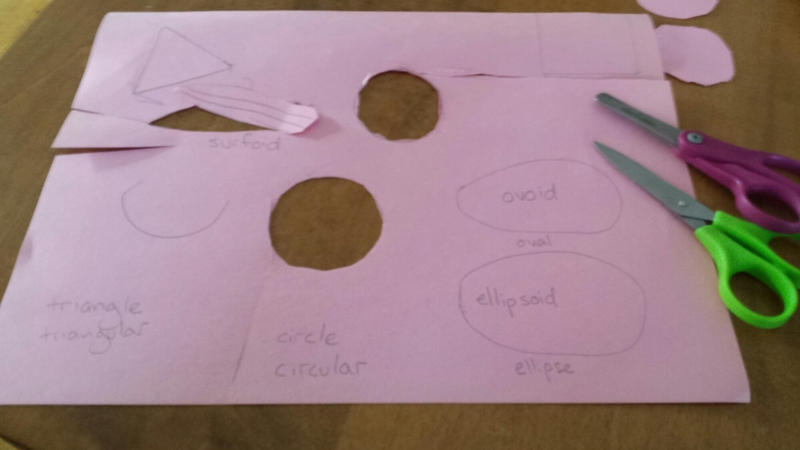 I drew an oval to show that the shape that looks like an oval is an ovoid. 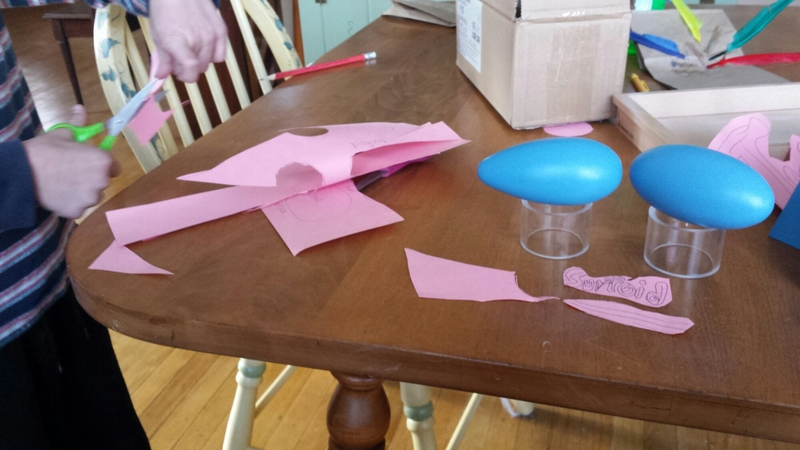 A shape that looks like an ellipse is an ellipsoid. We still couldn’t agree which was the potato or the egg. Then my son drew a surf board. “And a surfoid!” my five-year-old proclaimed. This is where math can get really fun. Though Montessori’s methods are a century old, they have a lot of parallels with Common Core Math that parents are complaining about (another reason we hate it might be because over 55% of adults in the U.S. can’t do 4th grade level math). Why is this so different than the math most U.S. adults learned growing up? Math like this shows us that geometry is just a way to describe the world around us. Instead of providing abstract equations to memorize with one right or wrong answer, we learn how to recognize patterns and use tools to manipulate our world using words and numbers. And when we learn to use mathematical tools instead of memorize equations, that’s when we learn how to create surfoids. That’s when math becomes play.